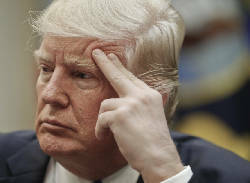 President Donald Trump is touting the House Republican health care plan, telling his supporters that "the House legislation does so much for you." But he's making clear that he's open to debate and negotiation. Trump tells supporters at a campaign-style rally in Nashville, Tennessee, that "we're going to all get together, we're going to get something done." The plan has been criticized by some conservatives as "Obamacare lite" and by others because of projections that millions would lose coverage. Trump is telling supporters at a campaign-style rally in Nashville, Tennessee, that he learned moments ago that a district judge in Hawaii had halted his order, which temporarily suspends the U.S. refugee program and bars the entry of people from certain Muslim-majority countries. Trump says the ruling is "unprecedented judicial overreach" and "makes us look weak." The White House is planning to make senior aide Dina Powell a deputy national security adviser, according to two people familiar with the details. Powell will be deputy national security adviser for strategy, working with national security adviser H.R. McMaster. A person familiar with the move says K.T. McFarland will continue to hold a position as deputy national security adviser. Both people requested anonymity to discuss the plans ahead of an official announcement. Powell currently serves as an assistant to the president and senior counselor for economic initiatives. She has been a key adviser for first daughter Ivanka Trump inside the White House. President Donald Trump is celebrating his predecessor Andrew Jackson, hailing the former president as an inspiration and drawing comparisons between them. Trump says on the 250th anniversary of Jackson's birth that Jackson was "one of our great presidents." He says Jackson opposed the "arrogant elite" and asked the audience: "Does that sound familiar to you?" Trump is speaking in front of the Hermitage - Jackson's home in Nashville, Tennessee — which he toured before delivering remarks. He says the visit was "inspirational," and added that "I'm a fan." President Donald Trump is laying a wreath at the tomb of Andrew Jackson on the 250th anniversary of the former president's birth. 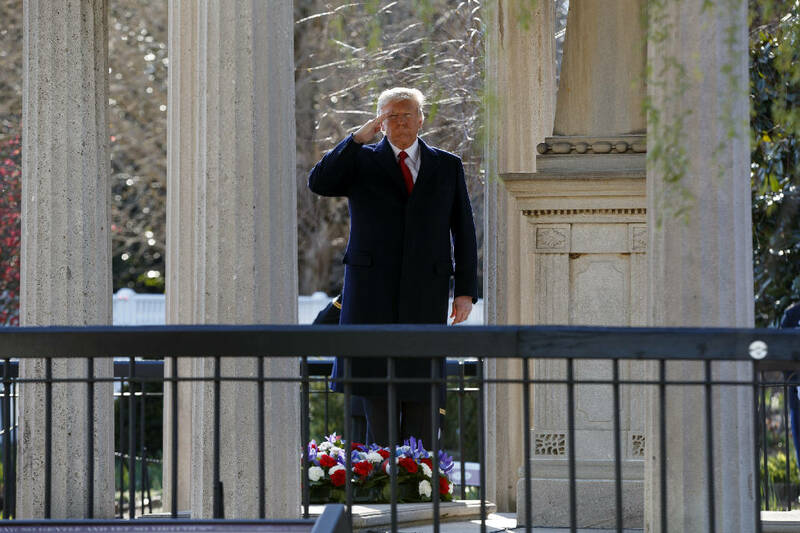 Trump stood at the grave, his hand raised in a salute, as taps was played. The president also toured Jackson's home, the Hermitage, in Nashville, before holding a rally in the Tennessee city later Wednesday. Jackson has enjoyed a moment of resurgence thanks to Trump. During the campaign, some of Trump's aides took to comparing him to the former president — a fellow populist outsider who took on a member of the Washington establishment and ran a campaign railing against corrupt elites. The museum's president says attendance has surged since the November election. President Donald Trump's decision to re-examine Obama-era fuel economy standards is meeting with strong opposition from officials on both coasts. California Gov. Jerry Brown is denouncing the Trump administration's move, telling EPA director Scott Pruitt in a letter Wednesday it was a "gift to polluters." Brown warns automakers in another letter Wednesday that his state will take the "necessary steps" to preserve its current emissions standards. Meanwhile, New York Attorney General Eric Schneiderman says in a statement that the president's action "represents a dramatic wrong turn in our nation's efforts to fight air pollution from passenger cars and trucks, and protect the health of our children, seniors, and all communities." Schneiderman says he is speaking for a coalition of attorneys general from nine states, including Maryland, Massachusetts and Oregon. President Donald Trump is standing by his tweet that the Obama administration wiretapped him last year. Speaking on Fox News' "Tucker Carlson Tonight," Trump says "wiretap covers a lot of different things." Trump also says in the interview that he expects "some very interesting items coming to the forefront over the next 2 weeks." Republican and Democratic leaders of the House Intelligence Committee say they have seen no evidence supporting Trump's claim that the Obama administration wiretapped him. The full interview will be aired Wednesday night. President Donald Trump says he has "no idea" how his 2005 tax documents were made public but says the move was "illegal" and a "disgrace." Trump says in an interview with Fox News' "Tucker Carlson Tonight" that the tax records should not have been leaked but he says "it's certainly not an embarrassing tax return at all." Reporter David Cay Johnston revealed the tax documents in an interview with MSNBC's Rachel Maddow. The two pages showed that the president earned $150 million in 2005 and paid $38 million in income taxes that year. Trump refused to release his tax returns during his campaign, breaking precedent with previous presidential nominees. President Donald Trump is praising the Senate for its support of his national security adviser, Lt. Gen. H.R. McMaster. The statement Wednesday followed a vote by the Senate Armed Services Committee to re-appoint McMaster as a three-star general "to a position of importance and responsibility." National security advisers aren't subject to Senate confirmation, but McMaster elected to remain in uniform rather than retire from military service, and generals need the chamber's approval when they're promoted or change assignments. Trump says in the statement that "the Senate's broad, bipartisan support for General McMaster affirms that he is the right person for this job." The lottery for tickets to next month's White House Easter Egg Roll opened Wednesday. But hurry, it closes in three days. President Donald Trump and first lady Melania Trump previously announced that the 139-year-old tradition of rolling pastel-colored, hard-boiled eggs across the White House South Lawn will take place April 17. Tickets are available only through the lottery, which opened at noon Wednesday and closes at noon Saturday. The website is http://www.recreation.gov. It doesn't cost anything to enter; tickets are also free. The White House says winners will be notified by email on March 31. Families with children ages 13 and under may participate in the day of festivities. The annual Easter Egg Roll dates to 1878 and the presidency of Rutherford B. Hayes. The White House says President Donald Trump told a Saudi delegation that he hopes to continue their consultations for regional issues, including the Israeli-Palestinian conflict. The statement from the White House, released a day after the president's meeting with Saudi Deputy Crown Prince Mohammed bin Salman Abdulaziz Al Saud, emphasized Trump's "strong desire to achieve a comprehensive, just, and lasting settlement to the Israeli-Palestinian conflict." The statement also says that both sides noted the importance of "confronting Iran's destabilizing regional activities" while continuing to enforce the Iran nuclear deal. Trump and the Saudi delegation also discussed their mutual commitment to fighting "Daesh" — the Trump administration using the Arabic acronym for the Islamic State group for the first time. The journalist who received a copy of a portion of President Donald Trump's 2005 tax returns says Trump doesn't want the American people to know who "he's beholden to." In an interview on ABC's "Good Morning America" on Wednesday, journalist David Cay Johnston says it's possible that either Trump or someone close to him sent him two pages of Trump's tax return. Johnston, who says he received the documents by mail, unsolicited, revealed his findings Tuesday on MSNBC's "The Rachel Maddow Show." He says it's possible that he only received two pages of the returns because "somebody isn't going to take the time to copy the entire tax form." But he notes that the documents still leave many questions unanswered, including "who he's beholden to and what the sources of his income are."